The Goliaths are pretty much ready to sacrifice their numbers advantage to get rid of Angelina after catching her red-handed trying to manage the jury with the Elizabeth boot. The Davids get an even bigger opportunity to make this happen: they find an advantage! Yes there was a clue at the merge feast but no one noticed it, so it got re-hidden. Davie and Nick find the clue, Davie provides the dancing diversion, and Nick and Carl search around the palm tree until they find a steal-a-vote advantage. Carl opens up to his allies that he has the Idol Nullifier. And Davie, well he's still keeping his idol secret. But it's Advantageddon for the David tribe! But their obstacle for surviving the game comes from an unlikely source: Mike. 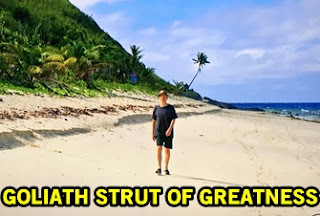 Despite being a part of the "Strike Force" cross-tribe alliance, he's beginning to fear a David-uprising against him and sees Christian's threat level from both a strategic and fan lovability level. Oh hey, remember when Angelina said this same point a couple days ago? 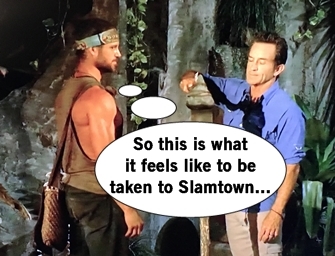 Unlike the usual Survivor story-telling, this is not the moment Christian wins immunity to protect himself. Nope, two-idol Dan wins immunity and the plan becomes more concrete to blindside the slide puzzle master. Angelina is the decoy plan and she's freaking out it could go wrong. Alec doesn't love the plan to oust Christian as it will ruin the relationship he's established with Nick, so he tips Nick off. Nick takes that info along to warn the others what's happening and ponder using their new advantage to save a fellow David. Davie knows the advantage helps, but his secret idol would guarantee his safety. What's a guy to do? Tribal Council time! Angelina hopes she's back in the Goliath's good graces and while the Davids think she's a good target, they know it's a numbers game. Mike hints that Davids were involved in Elizabeth's vote and likely tonight's vote. There's talk about trust and the relationships needed to establish genuine trust and allies. Threats are targets and Angelina basically says Christian is a threat for having relationships and they have a little back-and-forth. 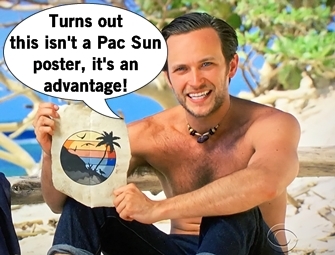 The tribe casts their votes and Probst touts out the urn and does his Immunity Idol speech. Davie gets up and plays his super secret Immunity Idol on a mind-boggled Christian. Angelina begins to freak out and begs Dan to play his idol on her. It's so reminiscent of the "Natalie, can I have your jacket?" incident and it's so glorious. This time, the request is answered and Dan plays his immunity idol on Angelina. 7 votes for Christian are null. 2 votes for Angelina are null. But surprise! The Davids outwitted them all and cast 3 votes to blindside John AKA the Mayor of Slamtown.